Chiropractors treat Sciatica with fantastic results. It is a common symptom lower back pain and occurs due to a varity of causes. Sciatica refers to pain down the back of the leg. 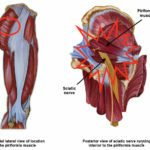 It is caused by the sciatic nerve becoming trapped or pinched. The Sciatic nerve runs from the lower back through the gluteals and down the back of each leg. When the Sciatic nerve first becomes trapped it can be made worse by inflammation, causing the pain to be very severe or debilitating. It will usually only affect one side of the body, causing tingling, numbness or weakness in the leg. It is important that we use ice not heat in the early stages of Sciatica, to help reduce inflammation around the nerve. Sciatic pain is most commonly caused by compression of the nerve root as it leaves the spine. In 20-50 year olds this is often caused by a prolapse or ‘bulge’ of the intervertebral disc in the lumbar spine. In older adults it can be caused by changes associated with degeneration and osteoarthritis. Discs are not the only cause of Sciatica, it can also be caused by piriformis syndrome, spinal misalignments, poor posture, sitting awkwardly, bone disease or localised injury. At Hands On Health Care Clinic, we always get to the cause of your injury. We do a thorough history and examination, including spinal, orthopaedic and neurological examination. We will send you for any necessary diagnostic imagining such as X-rays or MRI’s before prescibing you a individual treatment plan. This plan is specially tailored to suit you and the cause of your condition. It will often involve muscle therapy, massage, stretching, dry needling, spinal mobilisations or adjustments, plus exercises to keep you improving at home.